Order a digital caricature of recent retirees, who will be hand-drawn from photo in Sport Theme or another concept of your choice. Caricature will be executed in black and white digital style by professional Photolamus artist, who will capture brilliantly facial features, professional uniform and any of your described ideas. If character of caricature is occupied with a specific sport or hobby, then we can include some of details in caricature. Caricature which will be gifted to a person in honor of Retirement will surprise him/her pleasantly. Caricature made as Retirement Gift can support this person and show the fact that life is always going on. Caricature will make a super personalized and memorable gift to the recipient. 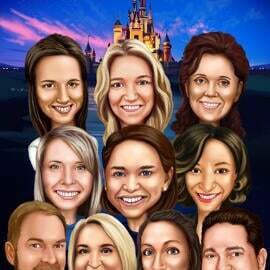 Digital Caricature will be delivered as a ready-to-be-printed JPG File to Email. Additional delivery options at extra cost: Caricature printed on Canvas, Photo Paper or Mug upon your wish. Worldwide delivery is available.